LA STAGE Alliance has announced its third annual LA STAGE Day, a day-long community event for the greater Los Angeles performing arts community. Generously hosted by California State University Los Angeles, the activities will take place on the campus of CSULA on Saturday, May 16, from 9am – 5pm. An inspiring, all-day event held at Cal State LA, LA STAGE Day brings together artists, administrators, board members, funders, and members of the community for a series of workshops, creative sessions, and panel discussions. This year’s keynote speaker will be Ben Cameron, program director for the arts at the Doris Duke Charitable Foundation. Speakers and session leaders scheduled to participate include (in alphabetical order) Jenny Byrd, Andy Crocker, Mark Doerr, Meg Fister, Ashley Dunn Gatterdam, Kiki Ramos Gindler, Sara Guerrero, Paula Holt, Tina Kronis, Matt Lehrman, Jay McAdams, Ted Russell, Seema Sueko, Elizabeth Tobias, Pamela Vanderway, and Paul Vandeventer. The schedule of the day’s events can be found at lastagealliance.com/lastageday. Current partners include LA County Arts Commission, La Mirada Theatre for the Performing Arts, United Scenic Artists Local USA 829, I.A.T.S.E., and Cal State LA. 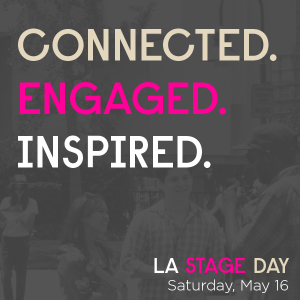 LA STAGE Day is from 9am—5pm on Saturday, May 16. To become a supporter of LA STAGE Day, for up-to-the-minute information, and to purchase tickets go to lastagealliance.com/lastageday. Stephen Sondheim’s Into the Woods is arguably the master composer’s most oft-produced musical. It premiered in December 1986 at the Old Globe Theatre in San Diego and opened on Broadway November 5, 1987 where it played for two years; was nominated for 10 Tony Awards (winning three); and racked up 765 performances. The show intertwines the plots of several Brothers Grimm fairy tales, including Little Red Riding Hood, Jack and the Beanstalk, Rapunzel, and Cinderella, among others. The plot is all tied together by an original story by James Lapine involving a childless baker and his wife and their quest to begin a family and their interactions with a witch who has placed a curse on them and with other storybook characters during their journey. When I was working in the Ahmanson Theatre press office back in 2002, we hosted the out-of-town tryout of what would be the show’s first (and to date, only) Broadway revival. Original director James Lapine was once again at the helm. What a thrill it was to watch him put this classic Broadway musical back together. 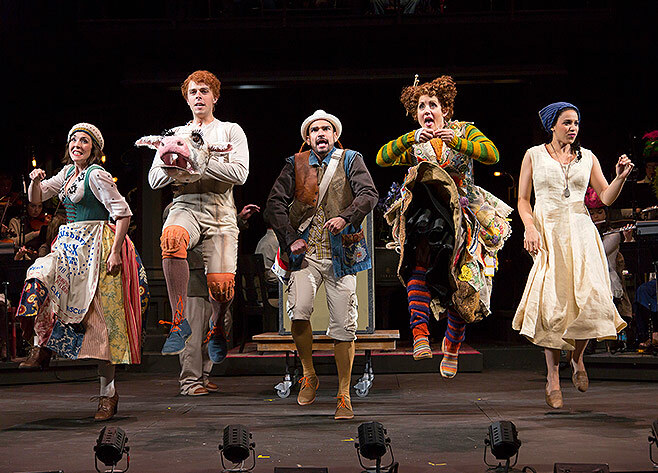 The Oregon Shakespeare Festival’s critically acclaimed production of Into the Woods arrives on December 2, bringing with it a 17-member cast and an 18-member orchestra. This humorous and heartfelt chase through the woods never fails to thrill and delight its audiences. See you in the woods! Into the Woods runs through December 21 at the Wallis Annenberg Center for the Performing Arts, located at 9390 N. Santa Monica Blvd in Beverly Hills. 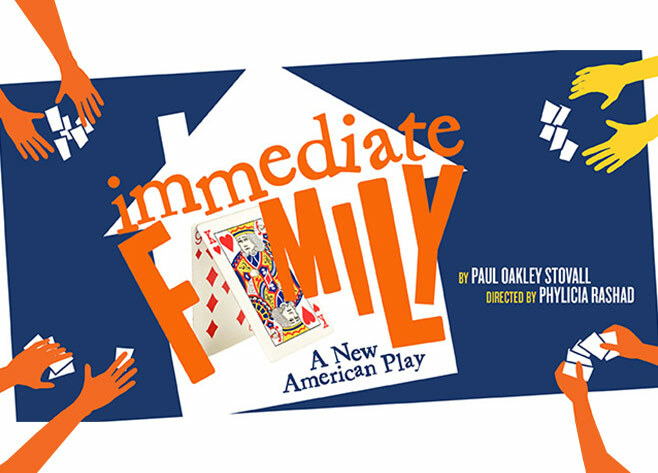 Back in 2007, Immediate Family by Paul Oakley Stovall had its West Coast premiere at LA’s venerable Celebration Theatre under a different title. Back then the play was called As Much As You Can. Eight years later, with a new title, what is not different is the level of comedy the show brings. If you’ve read other stories of mine here on LAArtsOnline.com you know I’m a big proponent of laughter. For me, the sound of 750 people laughing together cures a lot of chills. Immediate Family takes us to the Bryant Family reunion where race, sexuality, religion, evolving ideas of marriage, long-held beliefs, and long-kept secrets collide, setting the scene for a hilarious family showdown. Lots of dysfunction — something we’ve all experienced! Chris Jones of the Chicago Tribune said Immediate Family “… bursts with life …” and called it “a timely and important American play.” Add in “high stakes, fast-paced, and with rich comic characters” — what more could you ask for? Tony Award-winner Phylicia Rashad will direct Immediate Family at the Mark Taper Forum. 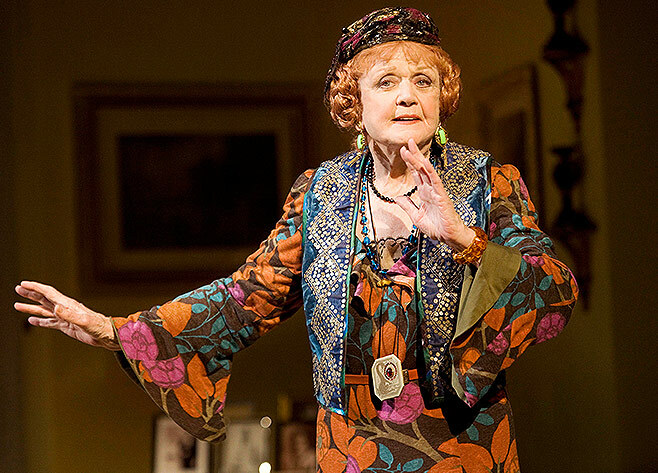 Did you see her work as an actress in Gem of the Ocean or her incredible direction of Joe Turner’s Come and Gone both at the Taper? In describing Ms. Rashad’s remarkable talents, all known superlatives have been used up. Remember, laughter is a good thing, so get on down to the Taper and have some fun. “Immediate Family” plays the Mark Taper Forum April 22-June 7.